Box Text: The search is on! Mickey tackles magnificent lands where fantasy and danger become real. A waterspout whirls Mickey around. A frantic Toyland suddenly flips upside down. To stay on his feet, Mickey runs, leaps, and bounces, slinging apples and marbles at his enemies. Mickey is on the trail of a wicked Witch named Mizrabel, who has kidnapped Minnie. 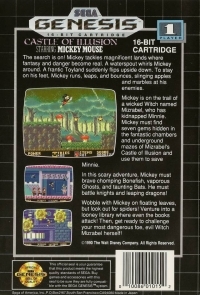 Mickey must find seven gems hidden in the fantastic chambers and underground mazes of Mizrabel's Castle of Illusion and use them to save Minnie. In this scary adventure, Mickey must brave chomping Bonefish, vaporous Ghosts, and taunting Bats. He must battle knights and leaping dragons! Wobble with Mickey on floating leaves, but look out for spiders! Venture into a looney library where even the books attack! Then, get ready to challenge your most dangerous foe, evil Witch Mizrabel herself! 04-10-2017 shepard11 Box Text The search is on! Mickey tackles magnificent lands where fantasy and danger become real. A waterspout whirls Mickey around. A frantic Toyland suddenly flips upside down. To stay on his feet, Mickey runs, leaps, and bounces, slinging apples and marbles at his enemies. Mickey is on the trail of a wicked Witch named Mizrabel, who has kidnapped Minnie. 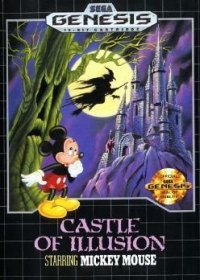 Mickey must find seven gems hidden in the fantastic chambers and underground mazes of Mizrabel's Castle of Illusion and use them to save Minnie. In this scary adventure, Mickey must brave chomping Bonefish, vaporous Ghosts, and taunting Bats. He must battle knights and leaping dragons! Wobble with Mickey on floating leaves, but look out for spiders! Venture into a looney library where even the books attack! Then, get ready to challenge your most dangerous foe, evil Witch Mizrabel herself! This is a list of VGCollect users who have Castle of Illusion Starring Mickey Mouse in their Collection. This is a list of VGCollect users who have Castle of Illusion Starring Mickey Mouse in their Sell List. This is a list of VGCollect users who have Castle of Illusion Starring Mickey Mouse in their Wish List.